Tachibana Hokushi 立花北枝 was the most important. Shida Yaba 志田野坡 , Sugiyama Sanpuu 杉山杉風 Sanpu, Sampu.
. WKD : Introducing Japanese Haiku Poets .
. Iga Shoomon 伊賀蕉門 Basho students of Iga province.
. Shoomon 蕉門 The 80 Disciples of Basho . Japanese sources quote his year of birth as unknown. The date of his death is May 12, 1718. Tachibana Genjiro. Tokiya Genjiro (Togiya Genjiro) 研屋源四郎. He also used the names DOI, MORI and a few others. 土井, 森氏, 鳥翠台, 寿夭（妖）軒, 趙子. He was born in a family of sword polishers. He was the most important of the 10 disciples of Basho. Hokushi was born in Kanazawa, a flourishing town during the Edo period. He was one of the great pillars of the haiku groups in Northern Japan (Hokuriku). His grave is in a famous park in Kanazawa, Ishikawa prefecture in Northern Japan. The following haiku is a play of words with KESHI, the name of the flower, also meaning: to erase. Basho wrote this haiku for his dear friend Hokushi. It tells us about his feeling when saying good bye to a haiku student (as he must have done many times on his walk through the narrow roads of the North). Tachibana accompanied Basho on his trip from Kanazawa to Matsuoka (now Fukui prefecture). 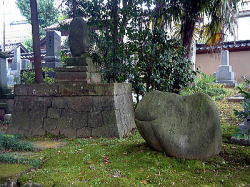 In the temple Tenryu-Ji 天竜寺 there is this stone memorial at the place where he and Basho finally parted. From here on, Basho was alone on his trip. The voices of the frogs.
. Matsuo Basho - Archives of the WKD .